Discover The Secrets To Building a Fundamentally Sound Pitcher, From the Ground Up! Pitcher. It's probably the most important position on the field. And without a doubt - the most complicated. From the stance, to the grip, to the mechanics of the windmill motion, there's a LOT to think about. And unless you pitched at a high level in your own career, teaching these critical skills to younger players can be a real challenge. Not to mention all the rumors, false innuendo and bad advice you'll find on the Internet. Softball Pitching Basics covers everything you need to know about pitching in Plain English... all explained with straightforward coaching tips, and live video demonstrations. You'll learn exactly how to install flawless mechanics... how to improve velocity and control… simple ways to correct common pitching problems… the exact techniques for teaching a killer change-up, nasty drop ball, and devastating rise ball… and much, much more. And loads more. This time-tested coaching system is simple, fast, and proven to work with pitchers of all ages and ability levels. It's designed specifically for the beginner coach or parent who wants a fun, simple way to teach pitching the RIGHT way. It’s easy to grasp, fast to implement, and 100% SAFE for your kids to learn. You don’t even need to know how to pitch a softball yourself. This system is perfect for amateur coaches or parents with little or no pitching knowledge. 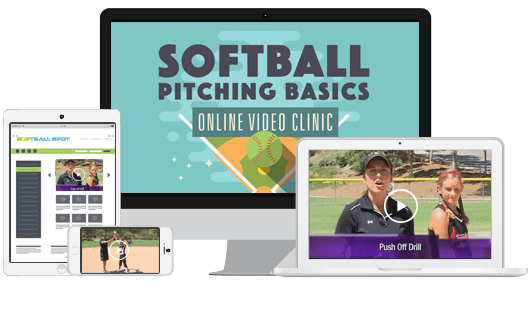 That’s right, Softball Pitching Basics is yours today as an online video clinic. As soon as your order is completed, you can instantly access ALL the material in living color… right over your computer screen or mobile device. To get even a small portion of the pitching drills, techniques, and coaching strategies condensed into this online video clinic, you’d have to hire a private pitching instructor for AT LEAST 4 or 5 hours. Most good instructors charge $75.00 per hour or more... so you'd easily spend $300 just to learn the basics. Even a "bargain basement" teacher would charge you $40.00 an hour, bringing your investment down to $160.00 (at the very least). But I’m not asking you to pay anywhere close to that. As part of this special Introductory Internet Offer, you can get the entire online clinic for just $49.95 $19 – less than the cost of a new ball glove for pete’s sake. Click here to place your secure order now! It’s fast, easy, and more secure than ordering a pie from your local pizzeria. That's right. Order this amazing video clinic. Watch it, then take up to 60 days to try out these secrets with your team. If you decide this isn't for you for any reason, or no reason at all - no problem. Just contact me and you'll receive a prompt refund of every penny of your purchase price - no questions asked, and no hassles. That's right... 60 days to test-drive this material - and if you're not totally blown away, you get your money back with no questions asked, and STILL keep everything as my gift to you. You read that correctly… there’s absolutely no risk. But a quick warning - this is NOT for everyone. The focus is on mechanics and techniques for youth and high school level pitchers.... it’s not meant for college or professional level coaches who need strategies for coaching adults. But it’s perfect for the amateur coach or parent who wants to learn the “truth” about pitching, and it gives you loads of concrete tips and examples you can implement with your team starting right away. Click here to place your secure order now! You’re gonna LOVE what you discover! PS – Remember… you have to see immediate, dramatic results in your pitchers after using these techniques, or I don’t expect you to pay for it. I’m talking more velocity, better control, and more confidence than she's ever had before. If this video doesn’t do everything I’ve promised, you get every penny returned to you, with no hassles and no questions asked. That's more than fair, don't you think? Just click here to place your secure order now... and you can access the material instantly, right over your computer screen, smartphone or tablet. But don’t wait… this special discount is only available to the first 500 coaches to order.